He/She minimizes the abuse or denies how serious it really was. He/She continues to blame you or others for his behavior. He/She claims that you’re the one who is abusive. He/She tells you that you owe him another chance. He/She says that he/she can’t change unless you stay with him and support him/her. He/She tries to get sympathy from you, your children, or your family and friends. He/She expects something from you in exchange for getting help. He/She pressures you to make decisions about the relationship. Has your abuser threatened you or your children if you think about leaving? 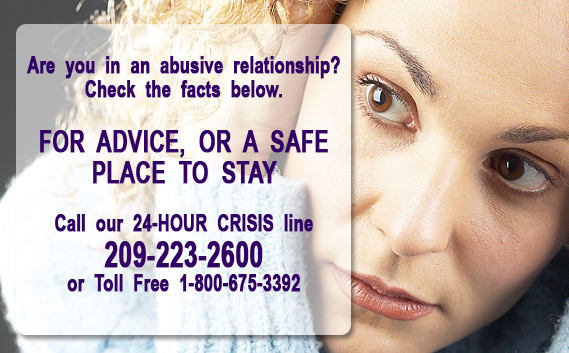 The abuse and violence in these situations typically escalates and staying puts you at greater risk than does leaving. There are a lot of resources available to you including 24 hour hotlines, emergency shelters, clothing, legal services, childcare and even job training. You deserve a life free of fear, abuse and violence. People are here and ready to help! If you decide to stay in your abusive home or with an abusive partner there are things you can do to help yourself protect yourself and your children. Contact the Domestic Violence and Sexual Assault Organization in your area, Operation Care in Amador County. They will provide emotional support, peer counseling, safe emergency housing, information, and other services while you are in the relationship, as well as if and when you decide to leave. Share your situation with your family and friends to build a support system. Let other people know what you are going through. It’s important that you have people to call with a code word in an emergency. Code Word. Come up with word that you share with your family, neighbors, children, co-workers that will alert them that you are in imminent danger and to call the police or 911. Red Flags. (know this signs) Stay alert. Your abuser will exhibit the same red flag or signs when when getting upset and moving toward anger that will explode into abuse or violence. Try to leave the house or area if you can. Safe areas. Identify safe areas in your house. Don’t run or retreat to bathrooms, closets or kitchens where there is no exit or household items that can be used as weapons. If possible head from a room with an outside door or window and preferably with telephone. Emergency Kit. Have a spare car key, cash, credit card (if you have one), important/emergency phone numbers, clothing for your and your children at a neighbors house. If you need to escape in the day or night you can do so quickly. Escape Plan. Practice your escape plan with your children so that in an emergency you don’t have to think about what to do. Emergency Numbers. Memorize emergency phone numbers. In case you don’t have to time to retrieve your emergency kit make sure that you have memorized your emergency phone numbers: family, emergency hotline, local shelter, police, etc. Think of a safe place to go if an argument occurs; avoid rooms with no exits (bathroom) or rooms with weapons (kitchen). Think about and make a list of safe people to call. Establish a code word or sign so that family, friends, teachers or coworkers know when to call for help. Remember you have the right to live without fear and violence. Change locks if the batterer has a key.